The sun is a constant motif in Odisha, a laid-back, sun-drenched state that runs along the coast of eastern India, well off the tourist trail. 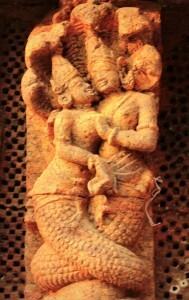 From the golden beaches of Odisha (formerly Orissa) you can watch both the sunrise and the sunset. At Konark, the UNESCO World Heritage Sun Temple was built to catch the rays of sunrise and light up a figure of Surya, the sun god. 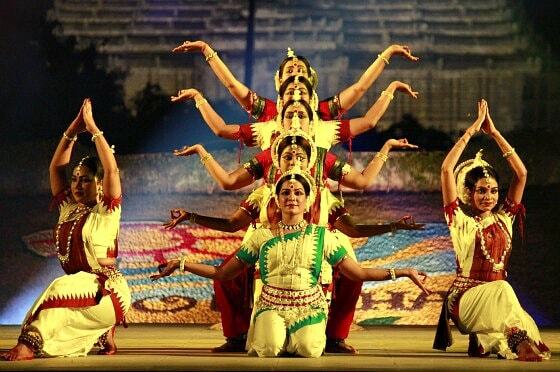 Odisha Tourism’s symbol is a colourful and childlike drawing of the sun. 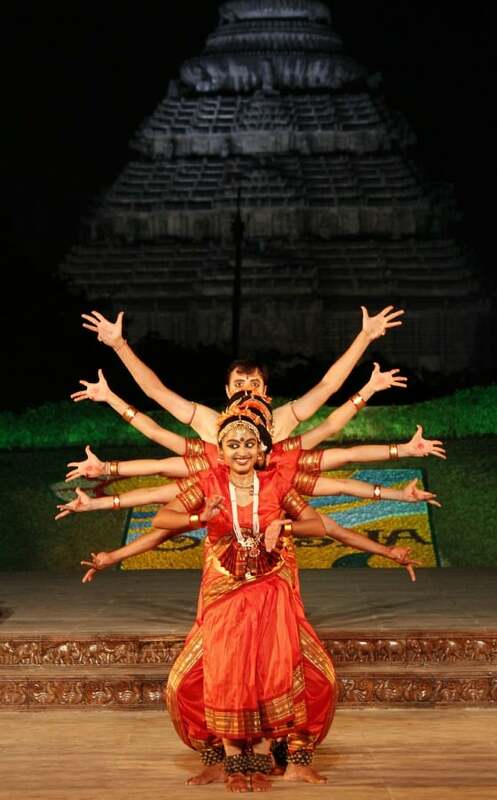 I came to Odisha (my 15th Indian state) for the annual Konark Festival — a celebration of Indian classical dance. 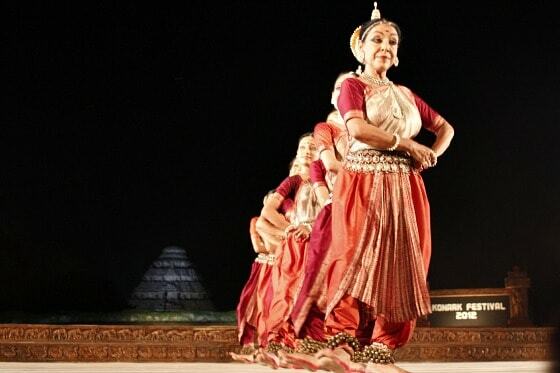 Odisha is the home state of Odissi dancing, my favourite form of Indian dance; and the Konark Festival is a showcase for Odissi — as well as a showcase for the state. 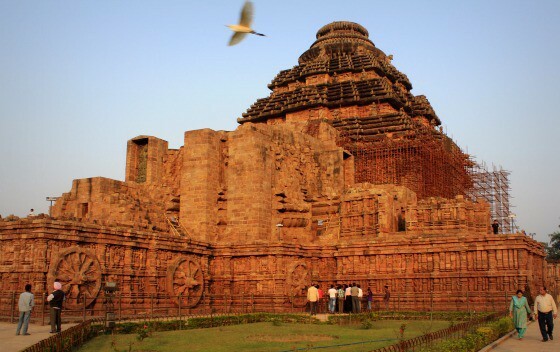 I long wanted to experience the Konark Festival and I was not disappointed. The venue is a beautiful open-air auditorium with the spot-lit pagoda of the Sun Temple as the dramatic backdrop. Colourful lights and lanterns filled the trees and lined the pathways, and the entire place was a fairy-tale like spectacle, beautifully decorated and the technical aspects of the festival were, overall, very well executed too. This year, the festival ran for five nights, from December 1st to 5th, and I attended the first three nights. All the dancing I witnessed was excellent, but I was particularly entranced on the second night, when I suddenly felt swept up in an Incredible!India moment. 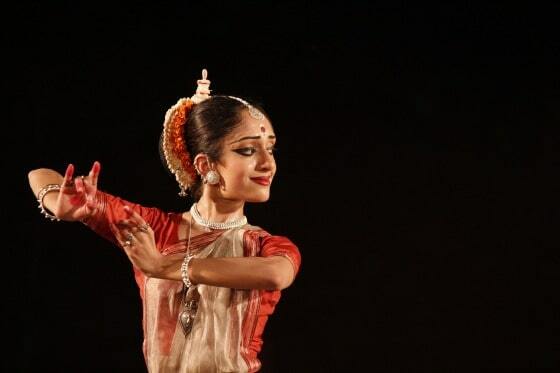 The Odissi dancers moved together in perfect rhythm on the stage, bathed in multicoloured lights and accompanied by live musicians and singers. The music stirred and soared and the dancers reverently, passionately poured their energy into their devotion. Behind them, the 12th century Konark Sun Temple was lit up against the night sky, and overhead colourful lanterns filled the trees encircling the outdoor auditorium. I reclined on a padded settee, like a maharani of old, and allowed the warm tropical night air, the Indian classical sights and sounds and the magnificence of the setting to completely envelope me. I was living the Incredible!India ad campaign, and even I could barely believe it. With all my amazing Indian experiences over the past seven years — meditating at sunrise on the Ganga, seeing the morning sun glint off the Taj Mahal, sleeping on the sand dunes of Jaisalmer — seeing Meera Das and the Gunjan Dance Academy of Cuttack perform at the Konark Dance Festival still gave me an unexpected magic moment. This renowned dance festival honestly surpassed all my expectations. And I owe it all to the gracious and generous Mohanty family and their company Swosti Travels. Mr and Mrs Mohanty came to Canada last year to present their home state, Odisha, to a room full of travel agents and writers. The dinner was co-presented with India Tourism — and together, they did a very good job of enticing me to a less touristy corner of India. Odisha, which is situated on the eastern coast of Indian, between Kolkata and Chennai, is known for beautiful beaches, ancient temples and a relaxed pace of life. 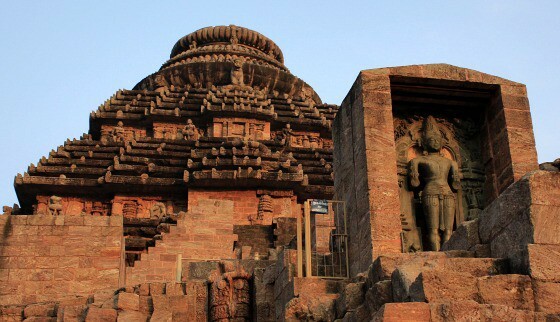 The pride of Odisha is the Konark Sun Temple, a UNESCO World Heritage Site and one of India’s truly great temples. 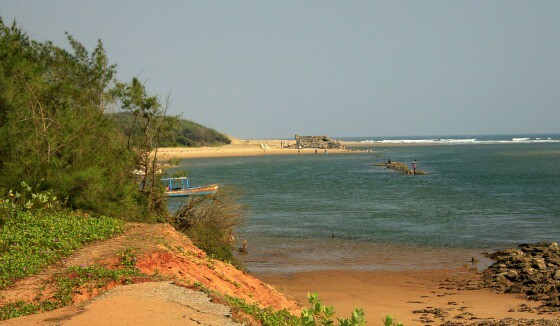 Odisha reminds me a little of Kerala, but it has its own unique flavour. It has a warm, dry climate and because there are so few tourists, it has a laid-back, pastoral atmosphere. People are friendly and not at all aggressive. 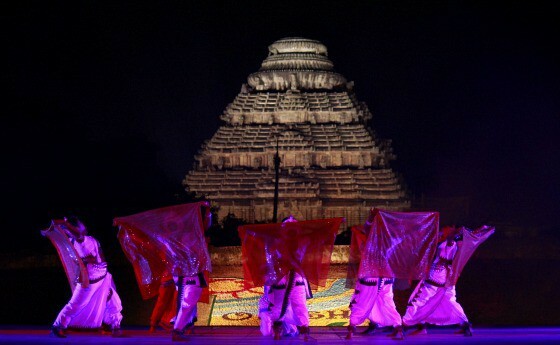 After seeing the pagoda of the Konark Sun Temple lit up as a backdrop to the Konark Dance Festival for two nights, I visited it for the first time at dusk on my third day in Konark. The 13th century Sun Temple is actually quite dark in colour — it’s known as the “Black Pagoda” — and surrounded by lush jungle. Apparently at one time it was near the beach, but now the sea is about three kilometres away. The entire, massive structure is a representation of the chariot of the sun god, Surya. Standing back, from the side, you can see the huge wheels. Aside from the impressive size and shape, the Sun Temple is famous for the intricate carvings that cover its surface — an astounding number and variety. You can see people performing mundane household chores as well as, ahem, less mundane sexual acrobatics. I will be writing an entire blog about this temple and the commentary of my guide Krishna, who waxed knowledgeably and poetically as he showed me around and explained the mathematical and astronomical as well as mythological significance. Konark is actually a small town and there is very little to be seen in this area aside from the temple, the festival and the long, wide sand beach. 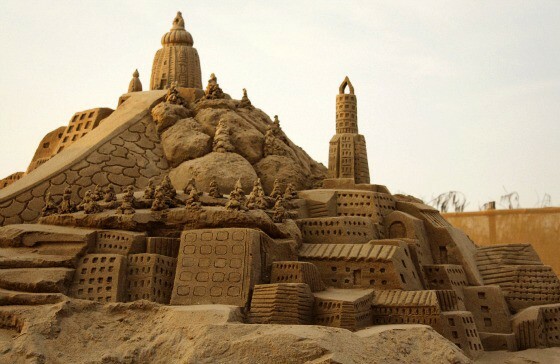 But the festival includes an International Sand Art Festival and other displays such as a hand-loom exhibit. 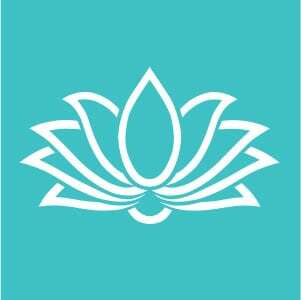 Many of the international sand carvers and die-hard dance fans stayed at the same place as me: The Lotus Eco Resort. I picked it because: one, the Lonely Planet recommended it; and two, it’s the only game in town. Though we got off to a bit of a rocky start (there were some lags in service), I slowly fell in love with the Lotus Eco Resort — in spite of its lack-lustre management and slightly ramshackle appearance. It occupies a lovely, remote spot, visited only by a few fishermen each day (who each give a portion of their catch to the resort restaurant: I ate fresh caught fish each day!). The Canadian pine cabins are small, but perfect. They are in very good condition and have every amenity you need. The grounds are nice, but not as well kept as possible; and the restaurant is a bit run-down. Some plain tables and plastic chairs are plopped down in the sand, near the beach, outside the restaurant, and this is where I usually ate. After a few false starts trying to get good, fresh food from the kitchen, one of the many wonderful resort guests I met, a man from Kolkata, introduced me to the chef Sunil — a warm man who is a very dedicated and talented cook. So once I started ordering directly from Sunil, I ate very well indeed. Crisp dosas for breakfast and fresh fish for dinner, bathed in the distinctive mustard-flavour seasonings that characterize Odiya cuisine. I also rearranged my room slightly to put a small desk under the window from where I had a view of the ocean, The Bay of Bengal, and the wide sandbar the runs along this portion of Ramchandi Beach. So here I sit writing this, as happy as I could be. 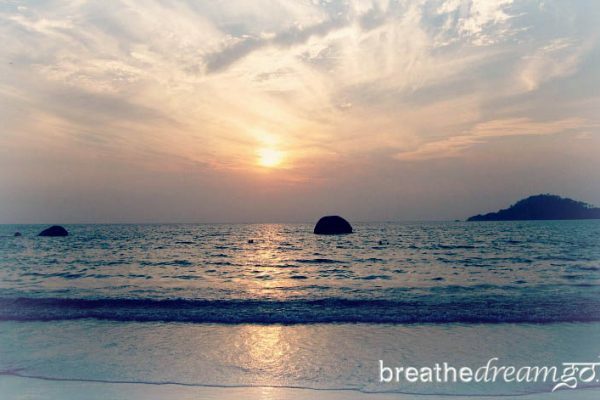 Once again I have managed to find myself a perfect spot in India — perfect for inspiration and relaxation, writing and photography — with sun and sand, good food as well as a rich cultural experience. Staying at the Lotus Eco Resort also gave me the opportunity for the kind of small adventure that I love. 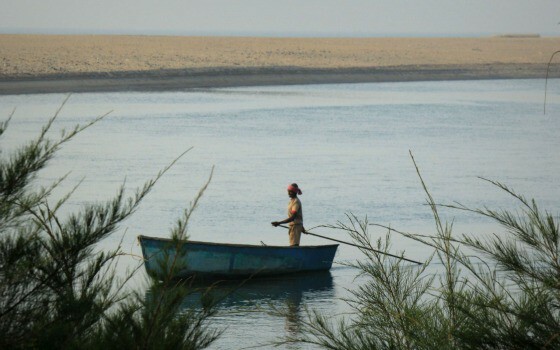 I walked out on the deserted beach one morning about 7:30 a.m., it was already warm and sunny, and a boatman was there. I gave him 600 rupees (about $11 or $12) and he took me on a motor boat road along the coast, past gorgeous, empty beaches on one side and a long, wide sandbar on the other. In the distance I spied a mandir (Hindu temple), with the red flag flying, and I asked him to stop at the jetty. I got out and walked up to the mandir and a small town square. The whole scene was peaceful, pastoral and completely off the tourist track. I bought a coconut for 10 rupees and sat and drank the milk; and then the man who sold it to me whacked it open so I could eat the fruit. A couple of young men stared at me, but I felt safe, accepted and left alone. After that, the boatman took me over to the sandbar and I walked on the ocean side for some time — and I was the only person, as far as I could see in each direction. I had no camera, no guide, no one knew I was there and I felt completely free. For some reason, I felt like Sabu in the “Thief of Baghdad,” and I strolled down the beach singing, “I long to be a sailor sailing on the sea.” I felt like I had been deposited there, in this sunny place, with the surf pounding on the shore, as if by magic carpet. I love a place that can give me this kind of adventure. Thanks Odisha! I’ll be writing more about my adventures in Odisha and getting to know the place, and the distinctive culture, but after a week or so here, my impression is that the state has a lot to offer. In December, the climate is perfect: warm and sunny in the daytime, and a bit cool in the evening. I am sure it is perfect all winter. There are lovely beaches, ancient temples, a rich culture of music and dance and distinctive, delicious cuisines that features really fresh fish, herbs, vegetables and fruits. And perhaps best of all, the state has a relaxed vibe and a slower pace of life. However, aside from the big cities, there are very few places to stay. 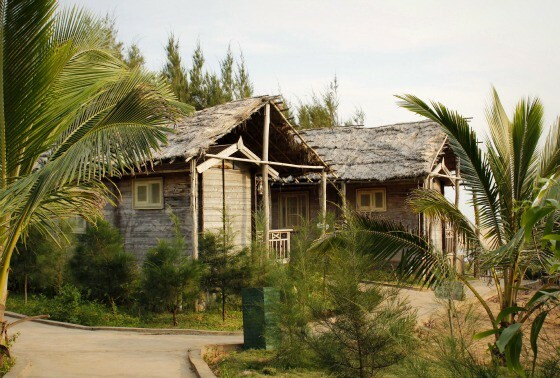 Only one “eco resort” in the country, for example. And though there are some fascinating and thriving wild life sanctuaries, they are hard to get to as they are a long way from Bhubaneshwar, the capital, and there’s no where to stay when you get there. Also, as friendly as the staff are in most places, they don’t really seem to know how to do their jobs. At one place, I asked the waitress to clear the table so I could sit down and eat, and she only wiped off one section, leaving crumbs and spills all over the rest of the table — and that is typical. She just didn’t know better. With a bigger commitment to tourism, more infrastructure and better hospitality training, I am sure Odisha could become a much more popular tourist destination for Indians and foreigners. It is the proverbial diamond in the rough; and unpolished gem. Thank you Swosti Travels and Odisha Tourism for hosting me.